These cranes would be used by railroads for small construction and maintenance projects. 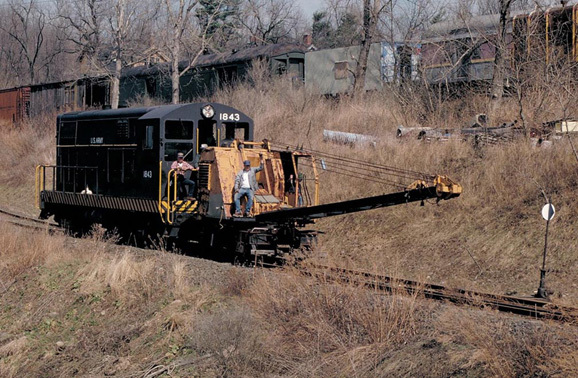 Since they were self-propelled, they did not need a locomotive to tow them around, and could also be used to pull a single flat car, dump car, or gondola to carry ballast, ties, or any other material. Due to their low profile, they could also be shipped by flatcar for quick movement to remote work sites. The Model 40 was produced between 1950 and 1997. The Model 50 succeeded it, which was first introduced in 1982. “Burro” is a trademark for a series of cranes first manufactured by Cullen-Friestedt, with the rights to produced the cranes acquired by Federal Sign & Signal in 1972. The line was spun off as Burro Crane, Inc., and acquired by Avis Industrial Corp. Badger Equipment Co. later acquired Burro in 1990 and moved production from Chicago to its plant in Minnesota. Our Burro Crane was donated by Vitale Bros. Contracting in Piffard, New York, in 1997. It came to them from the Foster-Wheeler plant in Dansville. Since then, a Detroit Diesel 453 engine was installed, and a new air pipe line was installed from one end to the other to allow pass-through so it can be moved as part of a train. The boom and cabling remain in storage. The Burro Crane is currently stored out of service.